Take Current Affairs quiz March 25, 2019 to enhance your General Awareness. Practice with our esteemed Current Affairs quiz March 25, 2019 questions which covers all important events across India as well as World. 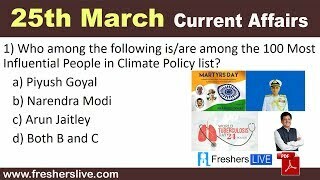 Make use of all important Current Affairs quiz March 25, 2019 questions with answers updated here, at free of cost to succeed in all competitive Exams and Interviews. State Bank of India (SBI) announced it had raised Rs.1,251.30 crore by issuing Basel III-compliant bonds. President adminsters Oath Of Office to Justice PC Ghose As Lokpal Chief. Which Indian player won silver in the under-21 women’s singles section of the Seamaster ITTF Challenge Plus 2019 Oman Open table tennis tournament? Indian Air Force to showcase Tejas fighter jet in Malaysian air during #LIMA2019. Who becomes the longest living chief executive in American history? Jimmy Carter becomes the longest living chief executive in American history. Which of the following National leader's death anniversary, on January 30th, is also observed as Martyr's day? January 30 which marks the death anniversary of Mahatma Gandhi is also observed as the Martyrs Day to honour our brave martyrs who have sacrificed their lives for the country. When is Marty's day or Shaheed Divas observed in India? On March 23rd, India observed Shaheed Divas or Martyr's Day as a tribute to the Bhagat Singh, Sukhdev, and Rajguru on their death anniversary. Karambir Singh is the next Chief of Indian Navy. Which Country recently banned a 74-page manifesto written by the man accused of slaughtering 50 people at two mosques in the city of Christchurch? Who is the President of Indonesia? Joko Widodo is the seventh and current president of Indonesia. Indonesia's first mass rapid transit (MRT) system to ease the traffic congestion was inaugurated in __________. Indonesian President Joko Widodo inaugurated the country's first mass rapid transit (MRT) system on 24th March. The aim is to ease the traffic congestion in the capital Jakarta. Who topped the 100 Most Influential People in Climate Policy list? The 100 Most Influential People in Climate Policy list has been topped by Alexandria Ocasio-Cortez (Congresswoman, US Congress). Who among the following is/are among the 100 Most Influential People in Climate Policy list? The “100 Most Influential People in Climate Policy” list is comprised of seven Indian names who took important measures to combat climate change. Piyush Goyal, the Minister of Railways and Coal, is one among the seven names. Which of the following Country held the first election after 5 years of Military rule? Thailand held its first general election after five years of military rule. The military ousted an elected government in a coup in 2014. What is the theme for the World Tuberculosis Day 2019? World Tuberculosis Day is observed on 24 March each year. The theme of World TB Day 2019 is ‘It’s time’. When is the World Tuberculosis Day celebrated? World Tuberculosis Day is observed on 24 March each year. World TB Day is marked by the World Health Organization (WHO). Are you looking for right place to enhance your Knowledge on Current Affairs of 25th March 2019 through effective Quiz section? FreshersLive grants you the advantageous Current Affairs Quiz questions with accurate answers for 25th March 2019 which covers all the important events, supreme Awards, major occurrences in the National as well as World level. All important Current Affairs Quiz questions of 25th March 2019 are updated instantly in this page. Everyday at least 25+ Current Affairs Quiz Questions are displayed in this FreshersLive page. Correct Answer for each quiz question is given at the end of the entire 25th March 2019 Current Affairs Quiz questions section. You can estimate and upgrade your GK by attending these useful quiz questions. Entire quiz questions of 25th March 2019 Current Affairs covers Competitive Exam as well as Interview point of essentially important topics like International News, National News (ie. Indian Affairs), Science & Technology News, Environmental News, Bills & Acts Passed by Government, Defence News, About important Persons, Places, Banking & Economical News, Awards & Honours, Sports News, Revolutionary Updates on Arts & Culture, Obituary, Summits & Conference, Important Committee, Schemes, Appointments, Important Days & its Theme for Current as well as upcoming Year, Books & Its Authors, Agreements & MoUs, Budget, Taxes, Various Important Lists & Indexes, Visits by World Presidents, Prime Ministers, Political affairs and all Current Events. 25th March 2019 Current Affairs Quiz Questions updated in this page are prepared in the sense to help all aspirants to succeed in various Competitive Exams like UPSC IAS and other Civil Services Examination, Various Bank exams like IBPS PO, IBPS Clerk, SBI PO, SBI Clerk, RRB PO, RRB Assistant, Insurance exams like LIC AAO, UIIC Assistant, Railway Exams, Various Central Government Exams like SSC CGL, SSC CHSL, and more. Attempt all the Current Affairs Quiz Questions of 25th March 2019 and evaluate your score by matching your response with the correct answers mentioned at the end of this quiz questions section. By practising the FreshersLive Current Affairs Quiz Questions on a daily basis, you can surely succeed in the competitive exams as well as the interviews easily. Make use of this ultimate resource to the fullest and quickly achieve your goal!